I served on board Ark from 1964 to 1966 (Far East including visit to Freemantle/Perth, Western Australia for Christmas 64) and then during her modernisation to have angled deck fitted and remove gun sponsns etc. Finished my commissions on Ark in 1972 as Leading Writer in Captain's Office. I have a lot of fond memories of Ark and lots of visits - good times! 5J3 mess was the S&S mess both commissions. Anyone remember these two commissions give me a buzz by e-mail. For John Culclough D069309 Ark Royal !964 - 1966 I was on board from April 1964 to December 1965 I flew home as the ship sailed for Fremantle. I was in the electricians mess 3J3. Be glad to hear from you. Pretty sure I relieved you Jan 72 having just returned from HMS Terror. I was a L/WTR in Captains Office along with Gerry Feakins, and was also in 5J3 mess, I left Sept 74 and was drafted to HMS Neptune. I am trying get information relating to Sonar/TAS ratings from HMS Vernon. I have found some material relating to HMS Ark Royal R09 regarding her having Seamen Sonar/TAS operators aboard. I was given to understand that HMS Ark Royal did not have sonar equipment fitted aboard her? Can any one help regard whether these ratings served aboard; and if so in what role. Were they employed only on seamanship duties? Can any one help regard which mess decks seamen were billeted? In particular from 1975 onwards. I served on the Ark 3 times. I was the Sailmaker on board. I was in 5c2 mess. 2m2, and 5g1, and I just found this site by chance very interesting. I am in Plymouth, Devon, U.K. Still sewing canvas. I joined HMS Ark Royal in April 1970 and was billeted in 4WA0 Mess. I was Foretop and Boats Party Parts Of Ship and it was in the launch pictured that we hit ice flowing down the St. Johns river off QE berth New York. I was acting as Bowman at the time for Officers and their guests. I was hoping to be able to help Brian Leslie in his question as to where the Ark was in Aug / Sept and Oct 73 as I have a copy of the Commissioning Book 70 - 73. The last entry in the book is about the Families Day held on the 26 July 73 prior to going into refit. Haven't looked at the site yet but being an Ex A/B (R) on the Ark I intend to and will also forward this onto a friend that also served on the Ark same time as me. I am the proud owner of one of the Ark 's senior officers' boats – FML 6814. She was on the Ark from 1971 to 78. 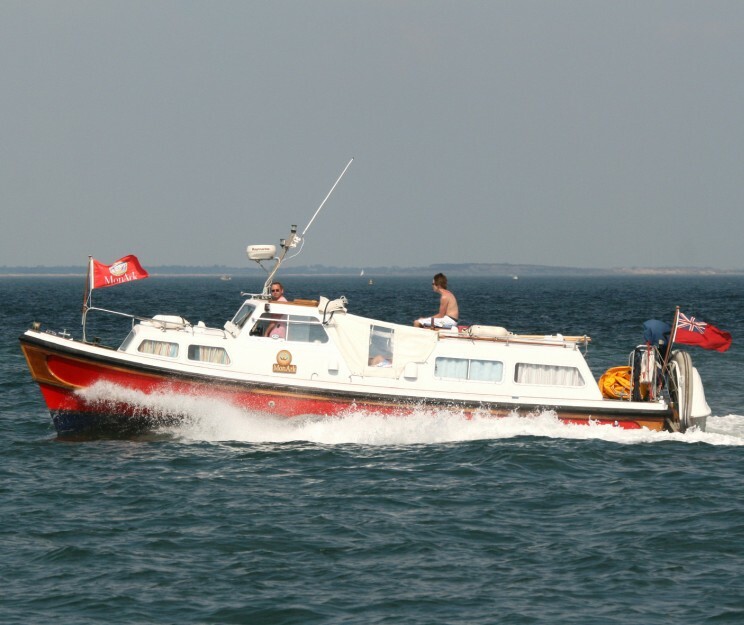 I would like to contact anyone with memories/pictures of this boat being used. I have seen from the various commissioning books that she was certainly in Florida , Malta , Gib and I have a photo of her flying the Prince of Wales standard at Spithead in 1977. I am attaching a photo taken last summer. There will be purists who are offended by her conversion to family boat but at least this way she is well looked after and gets lots of use. Please pass on my email to anyone interested. 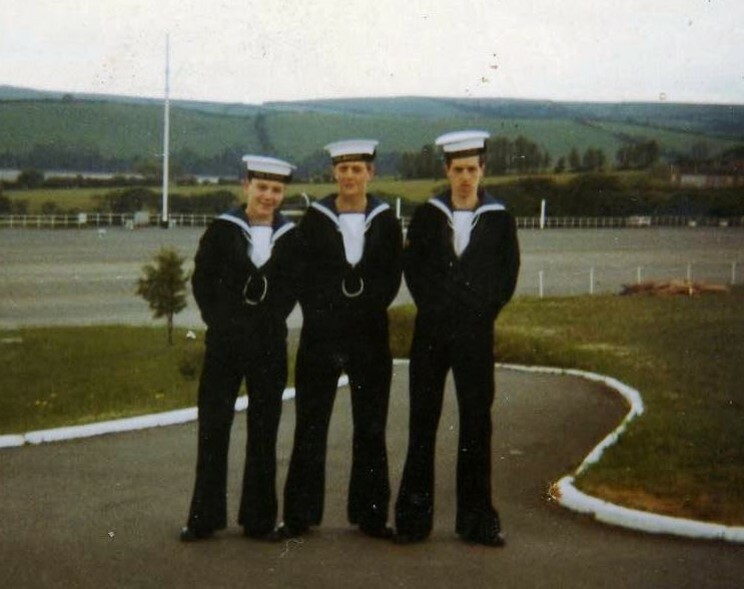 I was stationed on the Ark Royal 1971-74. I was in 5N and 4W messes, working in the ADR and also boat party, what I was wanting to know was where the ship was in August Sept Oct 73, can you help with this, or even put me in touch with someone that might enlighten me. Ark Royal was refitting in Plymouth during late 73. You may well remember the ship was given the freedom of the City of Leeds during October 1973. I was an REM at the time. Left the Ark in Jan 74. I am looking for John Ellis who served on the Ark Royal around 1966-67. I met him in Rochester, New York and we were a penpals for a couple of years. He studied architecture in London in 1968. I sure would like to know what happened to him! I tried to look him up in Wahsington, Devon during a trip there in the 80's to no avail although I had a great time trying! Any help would be appreciated! I'm trying to trace a cousin who served on the Ark Royal sometime in the 50s/60 we lost touch a few years ago my sister Diane had contact but has lost his address and tel no. His name was Maurice King, I do not know what his rank was, can you give me any advice? Hello all you ex Ark Royalers, my name is John Woollen (ex Stoker-ME1 L/me, Pome,D/K 946279. I did 3 or 4 commissions on the Wonderful R09 from 1955 to 1964 with several other ships in between and have some wonderful and colourful memories together with lots of photos too. Would love to communicate with any one who might possibly remember me. 2R1 mess(next to the bootnecks) was good fun, as we were all miscellaneous, from engineers stores. P,O,s messmen,Flight deck, air conditioning and ventilation etc, etc. Scouse Hollis, Ginger Ayling, Jan Keith, Jon Davies, Butch Beauchamp, I did several stints on the Flight deck on hold backs and slings which was good fun and helped with a chief stoker, (Sammy Smale) run a very lucrative photo firm flogging sets of 5 photos of places we visited and all manner of interesting things on and off the flight deck, these were particularly snapped up by the Airy fairies, a lot of whom had never been at sea before. Sammy was a great character and worked in the DB dept. The very bowels of the ship. Responsible for the efficient transfer of the many different types of fuel we carried, not just for the use of the different types of aircraft on board, but also the ships own massive consumption of the thick black, FFO used in the ships 8 boilers. Also to maintain stability too. I now live in Greece with my wife and celebrate our 50th wedding next year, all being well, so come on, let`s hear from you. 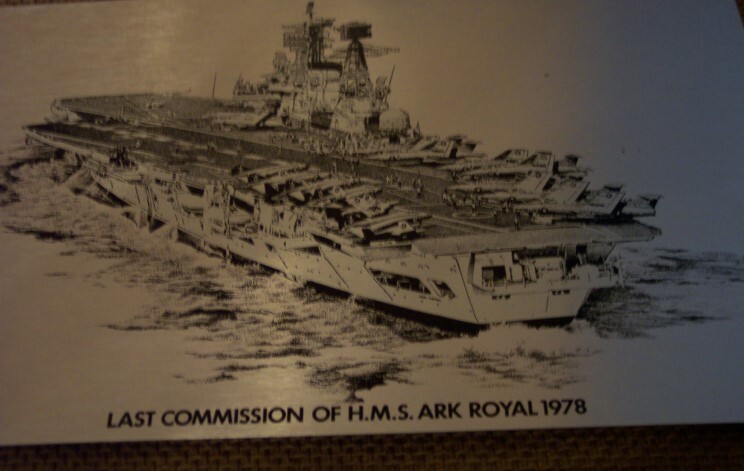 I am trying to trace my cousin's service on HMS Ark Royal possibly sometime in the 1960-70's. His name was Laurence (Laurie) but I don't remember his surname. He was in the Fleet Air Arm on the Royal. The only other thing I can tell you is that he sported a "Players Please" type beard, and was quite good looking. Unfortunately we lost touch with his wife and daughters after he died of a heart attack. He had left the Navy by that time. If anyone could help me with details of his service and friends, I would be very grateful, as I am trying to put together our family history. I was in 6g1 mess and 2r2 mess we had a fantastic ship and a great crew. It was a part of my life that I will never forget for so many reasons, suffice to say I was honoured to serve aboard. I owe an apology to l.m.e. Case of 6g1 mess and I was never able to offer it, so many good times and only one regret. God bless the memory of that great ship and all the shipmates who served therein. In July 1965 while the Ark Royal was in Changi, a few of the sailors spent quite a bit of time at our house, (my father was in the RAF) and used to take my brother and I swimming and to the markets. I remember one of the sailors particularly well, Alan Cronin, I was only nine at the time and when they left he gave me a silver Saint Christopher medal which was engraved "To Wendy Love Alan". I still have this medal and at the moment is pinned to my sons photo to protect him while he is overseas. I have often thought of Alan and wanted to thank him for his kindness to us. Can you help? Ark Royal was my last ship before I left on pension in 1972. One of the ways I filled those quiet nights in the Ops. Room whilst on passage was to research and catalogue the fortunes and misfortunes of the fourth Ark and her predecessors. I had intended to present the results on Ark's TV station over six episodes. The night before the first one was to be broadcast the Captain asked if I could condense it into one show as we would be passing over the (supposed) site of the wreck of the third Ark. I had only 24 hours to prepare and finally decided to play it by ear. I have no idea what it came out like but I still remember the salient facts as I read them. Had the Ark lasted another few years there might have been no need for a Falklands conflict. She was pretty good at scaring off predators. I am trying to find my father. My mother found out she was pregnant after his ship left Jacksonville, Florida in 1975. My mother remembers his name being Michael and he had a twin sister. She does not recall his last name. She remembers him being very tall, about 6'6 and that he flew the jets. She also remembers him telling her that his father died in a submarine accident. She says that he was her soul mate and regrets never being able to tell him about us. I also am a twin. I am trying to find two sailors that served on HMS Ark Royal round about 1960. Their names are Eric Rogers and Bill Logan who were about 19 or 20 years old. I am trying to track them down for my mum and her friend who knew them back them. Eric had dated my mums friend and he was the love of her life and he wrote to her regular but her parents had never gave her the letters until years later and at this point it was too late and their was no further contact. Please if you have any information on either of these two men could you help me to hopefully reunite them. Many thanks and I look forward to hearing from you. I served on HMS Eagle on your sister ship. When I was de-mobbed I used to watch the program, as most of my fellow ship mates (which include the one and only Master at Arms). I have been trying to buy the DVD or Video without any success. Unless of course getting ripped off at ridicules prices. Any suggestions?? The TV series Sailor has been re-released by the BBC on DVD and should be available through the BBC website. Hello shipmate, I've been browsing your excellent website and brought back a whole load of memories for this ex-Ark Royal matelot. I had the great privilege of serving aboard H.M.S. Ark Royal R09 twice (4v1 Mess). The first time aboard her with 892 Squadron (Phantoms) based at Yeovilton then RAF Leuchars, Scotland. The second time as part of the ships crew. I remember her with absolute happy memories of great messmates and great times. 1970 to 1973 with 892 Squadron 1974 to 1978 ships crew. I use a photo of the Big-A as wallpaper on my PC and use photos of the Big-A as a screensaver. I have the original BBC Sailor on Video Tape (VHS) and also on the DVD release which 2nd-rate compared to the original VHS tapes. My brother recorded all the episodes whilst I served onboard her. Every time I watch sailor it seems just like yesterday that I was a young sailor (18 years old) experiencing life at sea. It really was a great life, a life that I sorely miss and would highly recommend to any young chap who wants an exciting life and wants to make friends that will last all his life. I'm 55 years old now (56 this May) but still have my memories of a good ship with a good crew. It was a sad end when she was towed away to be scrapped in Scotland. It would have been befitting and an honourable thing to do if they had taken her to sea and sunk the poor old girl. She's gone, but I for one, will "never" forget her. Wherever my shipmates are now I bid them Fair Winds & God Speed. Big George (Geordie) 4V1 Mess, top grot middle pit. 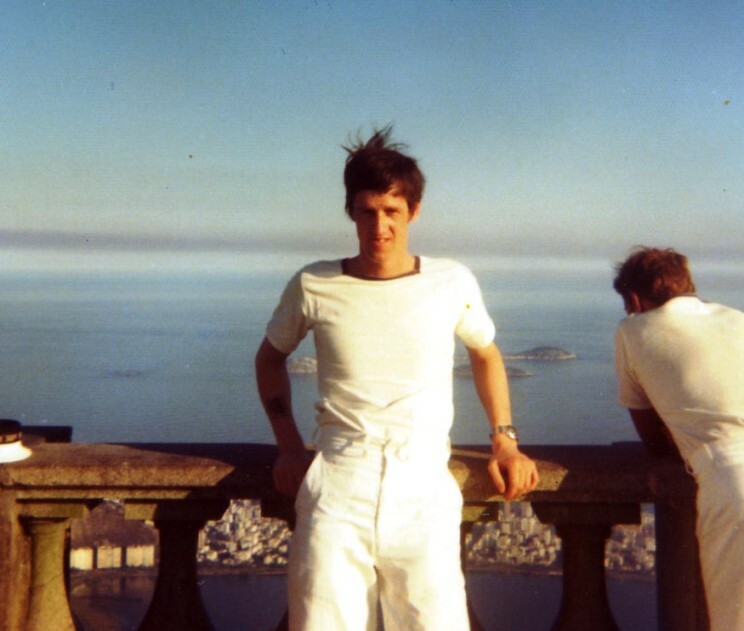 John Hannon in Rio de Janeiro, Brazil. 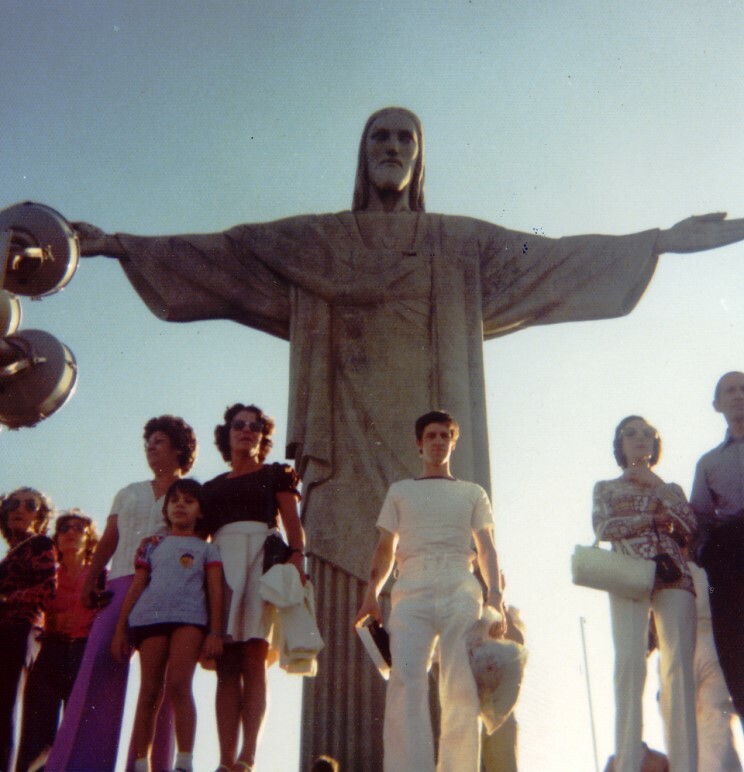 John Hannon (right) in 1970.
near Rio de Janeiro, Brazil. I am trying to verify a piece of information regarding the HMS Ark Royal R09. I have been informed that the admiral of this ship, during some period from the early 1950s through the late 1960s, was a Jesus Nasser, who, I have been told, was the third in command in the British armed forces. I have been searching in vain for any information about this Adm. Nasser without success, and I would be most grateful for any information you could provide me. I served on board HMS Ark Royal between April 1961 to February 1964. The ship visited Perth-Fremantle, Western Australia on August 19th-30th 1962 on her Far East tour of duty. On a second Far East tour in 1963, the ship did not visit Australia, as far as I can remember! on canvas picture of the Last commission of H.M.S. Ark Royal 1978. It was produced by Wendron Forge Helston Especially for the Souvenir Shop H.M.S Ark Royal. Do you know anything about this item.? To Sue Miles message above: Wendron Forge, Helston, Cornwall, England. Sadly their phone number is not in the directory any more and it appears they are no longer trading. In reference to your enquiry on the Ross Revenge .. Not sure I can be of any help but I was involved in the de-commissioning of Ark Royal in 1979 after three years of service on her. Not sure if I am right or not but I believe the Navy News ran an article on Ark Royal and had loads of shots showing her being towed and scrapping... I remember thinking at the time I should keep it for prosperity but have moved about so many times it got lost. And now I live in the States. Hope this helps. I hope you can help me find out about a visit the Ark Royal R-09 made to Melbourne, Victoria (Aus) in the very early 60's. Am trying to put the pieces of my life together and unfortunately I have no family photos from that visit - they all went missing when the family dissolved many years ago. I believe it was sometime between 1960-63 that the Ark Royal visited Australia, along with a few other ships of the Royal Navy and I was one of the hundreds of lucky people who were allowed on board for a tour of the great ship (I believe I also went on-board a destroyer). I was only a little girl at the time however it left a lasting memory; I can still hear the flapping of the ship's bunting in the high winds that day. I can't find anything online about that event - have tried the Melbourne Age & Sydney Morning Herald newspaper archives. Would love to find out if any of your regular website readers recall the event or if you have any records. I'm sure that the R-09 would be the vessel in question. Western Australia on August 19th-30th 1962 on her Far East tour of duty. On a second Far East tour in 1963, the ship did not visit Australia, as far as I can remember! My father (recently deceased) served aboard the Ark from 1964 to 1966. I am trying to track down the squadron he was attached to while serving. His name and rank were C.P.O. D.R. Sturgess. I believe he was on Vixens, but can't be certain. Unfortunately the fifth commission commemorative book does not list this information, whereas the HMS Centaur (on which he also served) second commission book does. I would be grateful for any help you may be able to give regarding this. I came across your website while doing some research for a documentary on the Ross Revenge the former side-trawler that became the home for Radio Caroline in the 1980's. I am wondering if anybody has either footage or photos of the Ark Royal being towed to the breakers yard in Cairnryan, Scotland in 1980 by Ross Revenge. Needless to say there's not much money in the pot but I am willing to pay for prints or more for footage. Dear Patrick I can't help with photo's but the book: HMS Ark Royal IV, by Richard Johnstone-Bryden, has a few paragraphs and pictures of The Ark being towed to Cairnryan. Hope this helps.